Sometimes you want an easy and quick pasta recipe that tastes incredible. Well, this recipe for ravioli with sautéed asparagus is all of that and more. It can be whipped up quickly and the addition of parmesan cheese at the end makes it a culinary masterpiece. I kid you not! Fresh store bought ravioli is cooked, then tossed with asparagus that has been sautéed in a simple butter and lemon sauce. A little bit of grated parmesan, and minced parsley are added at the end–just give it a toss and you’re done. I love asparagus, an early sign of spring around here, and I can’t resist buying it when I see it. With asparagus you want a simple sauce to enhance it’s flavor and this light lemony, buttery sauce is just right. All it consists of is butter, lemon juice and a dash of black pepper. Not at all heavy or greasy, it just coats the ravioli and asparagus. A couple of notes: The asparagus should be slightly damp when you sauté it. This helps with the sauce. So rinse your asparagus right before you chop it and add to the pan. 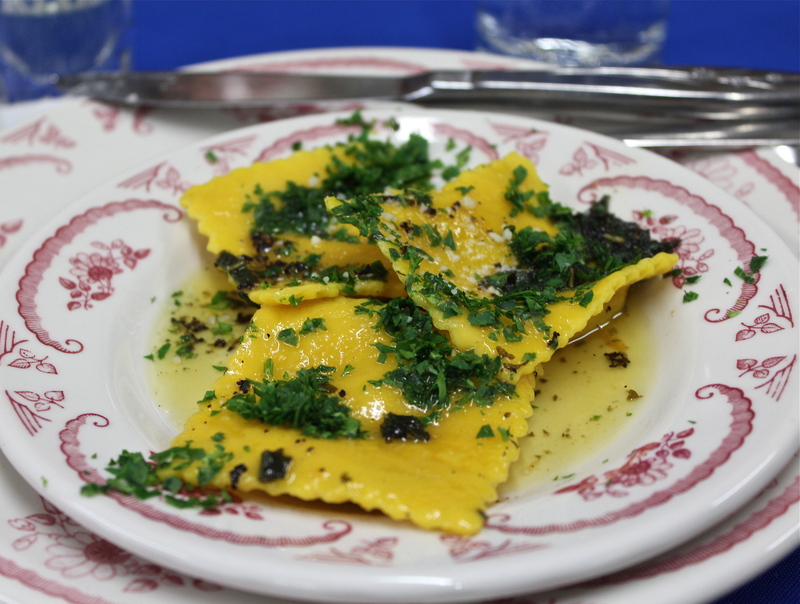 Also, you can use whatever fresh ravioli you like for this dish–cheese, mushroom, spinach would all be good choices. I used a three-cheese ravioli for mine. This is a dish that goes together very quickly so be sure to have everything prepped and ready to go before you start cooking. It takes no time to prepare the asparagus, chop the parsley and measure out the other ingredients, so this can be done while you’re waiting for the water to boil for the ravioli. 1. Bring a large pot of water to a boil. 2. Prepare asparagus by snapping off tough ends, then chopping into thirds, or smaller. Mince parsley, squeeze lemon and measure out butter. 3. In a large saucepan, melt the butter over medium heat until frothy. Add chopped asparagus to the pan, stir to coat asparagus with butter and cover with a lid. (If asparagus is damp, steam created will hasten cooking.) Cook for 4 – 5 minutes depending on thickness of asparagus. 4. Add ravioli to boiling water and cook as per package directions. Drain when done and place in a bowl. Keep warm. 5. When asparagus is done, add to bowl with ravioli with a slotted spoon. Leave any browned butter in the pan. 6. To the butter in the pan, add lemon juice, several twists fresh pepper, and bring to a boil. Stir for 30 seconds. 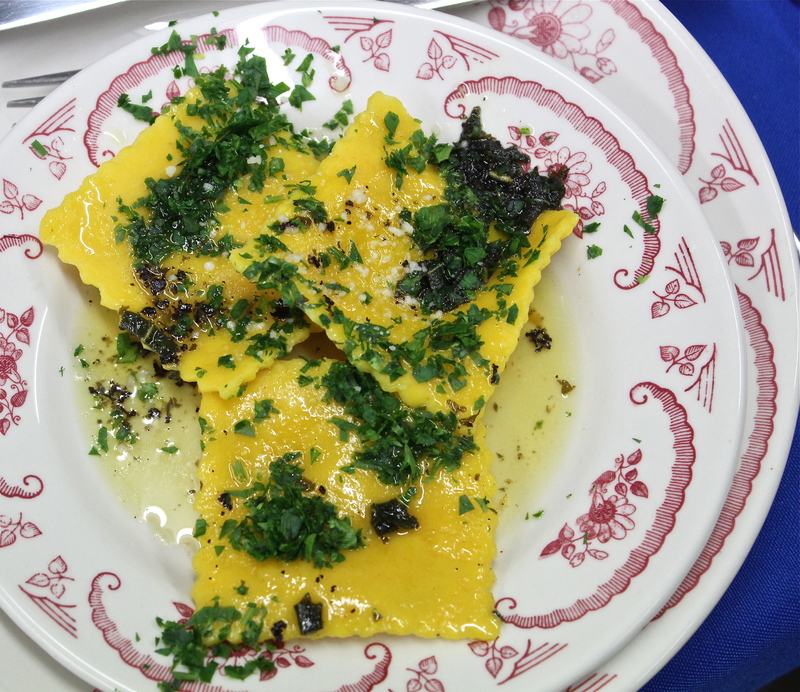 Pour the butter-lemon sauce over the ravioli and asparagus. This will just lightly coat them. 7. Add parsley and 2 Tbsp. Parmesan cheese. Toss to coat and combine. Serve with more cheese at the table. This is so good, I can’t wait to make it again. If you are looking to make a quick baked dish that is lasagna-like in its layering of ingredients this could very well be it. This is not lasagna in its truest form. This dish uses convenience items like ready-made pesto, jarred Alfredo sauce and frozen cheese-filled ravioli along with a bag of fresh baby spinach. This makes a very nice meatless meal that is filling and great tasting. For added flavor, or to incorporate some meat you could add pieces of cooked chicken, sausage or ground beef. I thought this was a a great put-together meal for times when you want to have a meatless meal. We really liked it. and for me, it was another way that I could eat spinach, and not be too aware of what I was eating. (I am always looking for ways to overcome my aversion to spinach.) The pesto adds a lot of flavor to this dish. I used my homemade pesto, but any commercial variety will do nicely. As I frequently do, I made only half of this recipe for two of us. 1. Preheat oven to 375*F. Chop spinach, and toss with pesto in a medium bowl. 2. Combine Alfredo sauce and vegetable broth. Mixing Alfredo sauce with broth. Spoon one-third of alfredo sauce mixture (about 1/2 cup) in a lightly greased 2 qt. or 11 x 7-inch baking dish. Top with half of spinach mixture. Layering the spinach on top of sauce. Arrange half of ravioli in a single layer over spinach mixture. Cover with half the ravioli. Repeat layers once more. Top with remaining Alfredo sauce. 3. Bake at 375*F for 30 minutes. Remove from oven, and sprinkle with shredded cheese. Bake 5 minutes or until hot and bubbly. Garnish, if desired. Super easy to make and so very good. My recipe today is targeted at week night cooking when you are short on time. Perfect for those evenings when you want to go meatless, or prepare a meal that’s vegetarian. It’s a hearty, nutritious and delicious soup and you can include greens and vegetables to your liking. The broth can be beef or vegetable, so it offers a lot of leeway to tailor it to your dietary needs. The basis of the soup is a package of small cheese ravioli; either frozen or fresh. You begin by sautéing the usual trio of veggies: onions, carrots and celery. Add the broth, bring to a boil. Add the ravioli and cook till tender; then add the greens to wilt them. That’s it! Sprinkle on some parmesan cheese at the table and serve with a whole-grain bread. This whole meal took me no more than 30 minutes to prepare. The recipe can be easily doubled for more servings or just to have some for another meal. Getting all the ingredients ready. 1. Heat the oil in a large pot over medium heat. Add the onion, carrots, celery and thyme and cook, stirring occasionally , until the vegetables begin to soften, about 4 minutes. Add the broth and 3 cups water and increase the heat to high. Cover and bring to a boil, then add the ravioli. Reduce the heat to medium and simmer until the ravioli are tender ( according to package directions for cooking). Letting it simmer till tender. 2. Add the escarole to the soup and cook, stirring, until wilted. Season with salt and pepper. Ladle the soup into bowls and sprinkle with the cheese. Serve with the bread. Ravioli and vegetable soup. Serve with grated cheese. Nutritional Profile: Calories: 262; Fat, 9 g.; Carbohydrate 34 g.; Protein 12 g.
Eating out at home can produce an extra special dinner. This one came about because of a half-bag of large shrimp that were occupying some prime real estate in my freezer. Shrimp scampi is a dish that I frequently order when we are out, and I also make it at home. Pairing shrimp with ravioli, however, is a new idea. This whole meal came together without my having to go out to buy any other ingredients. On my last shopping trip I had purchased a package of fresh cheese-filled ravioli, just because I like to have them on hand for a quick meal. They are one of my favorite foods and are a stand by for me. I also had an extra pint of grape tomatoes and a partial package of mushrooms. This meal just goes to show you how easy it is to make restaurant style meals in your own kitchen at a fraction of the cost, and took only minutes to prepare. Staying home for dinner is not boring, costs far less than eating out, and you eat better. I hope you give this meal a try, just add a loaf of good Italian bread and a salad and you will be in heaven. Chopped garlic and parsley; and the butter and flour mixture. 1. Get water ready for ravioli, but don’t start cooking ravioli until the scampi is almost ready. My ravioli only took 8 minutes to cook. 2. Over medium high heat place a large sauté pan, as it gets hot add olive oil and then the chopped garlic. 3. Allow garlic to cook for about 15 seconds then add the shrimp and let them cook for 2 – 3 minutes until they are almost done. 5. If you are using fresh ravioli, then this would be the time to add the ravioli to the boiling water. 6. Add the chicken stock to the pan with the mushrooms and allow to come back to a low boil, reduce heat. 7. Mix the butter with the flour, getting as much of the flour pressed in as you can. (I did this in advance so it was ready when I needed it. Use a fork and press the flour into the butter until you have a thick paste). Place this in the hot stock and mix together. This will thicken the stock. 8. Add the shrimp back in, and finish with the grated cheese and freshly ground black pepper. Turn off the heat and add in chopped parsley. Add the shrimp back into the mixture, plus parsley and cheese. 9. Drain ravioli and place 4 – 5 on each plate then top with shrimp and equal amounts of mushrooms, tomatoes and sauce. Plate it up. Sit down and enjoy! 10. Sit down and enjoy your restaurant style dinner of Ravioli and Shrimp Scampi. 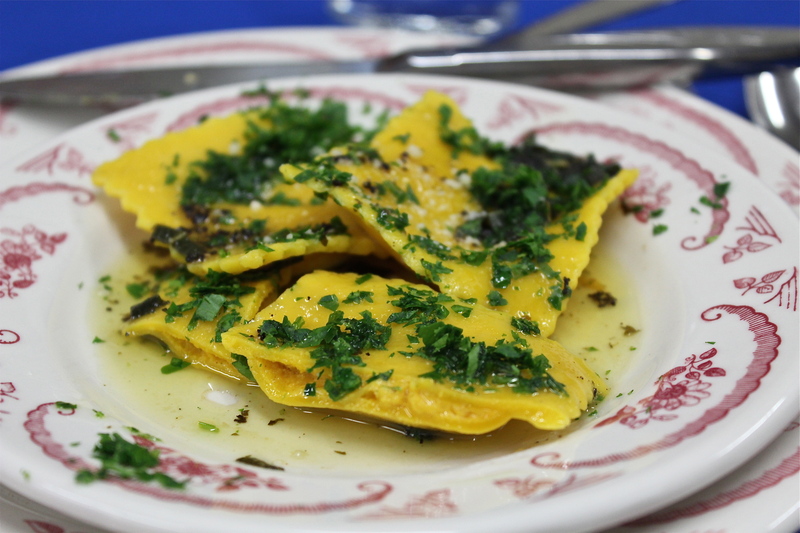 Not too long ago we were out for a special dinner that was catered, and for the appetizer we were served this dish; butternut squash ravioli with a sage brown butter sauce. It was so good I wanted the recipe, but, sadly, it was not available from the chef. So I went on the hunt for a similar recipe, and on the Food Network website, I found this one by Emeril Lagasse. He roasted his squash for starters, but I simply steamed mine, then mashed it with the same results. Possibly roasting the squash brings out a debt of flavor that mine lacked, but with the nice balance of seasonings that are added I was perfectly satisfied with my results. I found that using won ton wrappers is a good substitute for fresh pasta dough, if you’re in a time crunch. However you don’t get that toothy “al dente” texture. Not a big issue for me; we enjoyed them all the same. In trying out this recipe I served the ravioli as a side dish with roast chicken, and it was a good compliment. The original recipe is written to be served as an appetizer, and that is very nice for a sit-down dinner where silverware is in use. But I would not try to serve it when people need to balance a plate and use a fork to eat it. 1. In a large saute pan, over medium heat, melt 1 Tablespoon of the butter. Add the shallots and sauté for 1 minute. Add the squash puree and cook until the mixture is slightly dry, about 2 to 3 minutes. Season with salt and pepper. Stir in the cream and continue to cook for 2 minutes. Remove from the heat and stir in 3 Tablespoons cheese and nutmeg. Season with additional salt and pepper as needed. Cool completely. 2. Start a large pot of salted water over medium-high heat and bring to boiling. Cut the pasta into 3 – inch squares. (Or alternately, use won ton wrappers.) Place 2 teaspoons of the filling in the center of each square. Bring one corner of the square to the opposite corner, forming a triangle, and seal completely, by wetting the edges slightly and pressing together. Add the ravioli to the pot of boiling salted water. Cook until al dente, about 2 to 3 minutes or until the ravioli float and are pale in color. Remove the pasta from the water and drain well. Season with salt and pepper. 3. In a medium saute pan, melt the remaining 8 Tablespoons butter. Add the sage leaves to the butter and continue to cook until the butter starts to brown. Remove from the heat. 4. Place some of the ravioli in the center of each serving plate. Spoon the butter sauce over the ravioli. Sprinkle with additional cheese and garnish with parsley. Can be served as a side dish also. 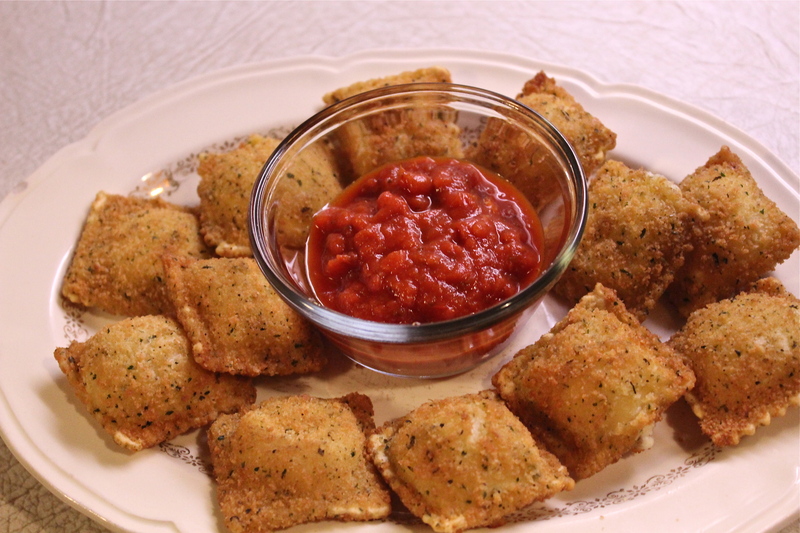 These raviolis breaded and baked till golden, then served with warm marinara sauce, are perfect little appetizers or munchies for when folks stop by and you need a quick snack, or for yourself while you’re watching a game. Be sure to make plenty, because once everyone gets a taste of this crunchy, cheesy, yumminess, they’ll be gone in no time. And the best part is they are baked, not fried. On your next trip to the supermarket do your self a favor and pick up a package of fresh or frozen ravioli, either cheese or meat filled. Either works fine, but we particularly like the three-cheese variety. There is no need to pre-cook them. When you’re ready to make them, just dip them into the egg wash, then the seasoned bread crumbs. Place on a baking sheet and bake until puffed and crisp. 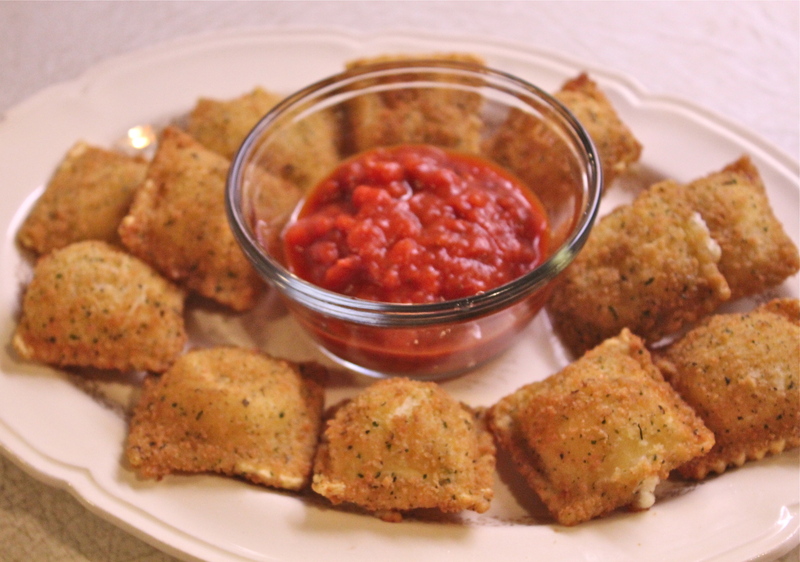 Serve them warm with marinara sauce for dipping. Very easy to do, and they look like you spent a lot of time on their preparation. 1. Preheat oven to 400*F Place a wire rack on a baking sheet, or simply line with foil. 2. Beat together the egg and water in a small bowl. Mix together the bread crumbs, oregano, basil, garlic powder, salt and cheese, in a large bowl or shallow pan. 3. Dip each ravioli in the egg, and then roll in the bread crumb mixture. 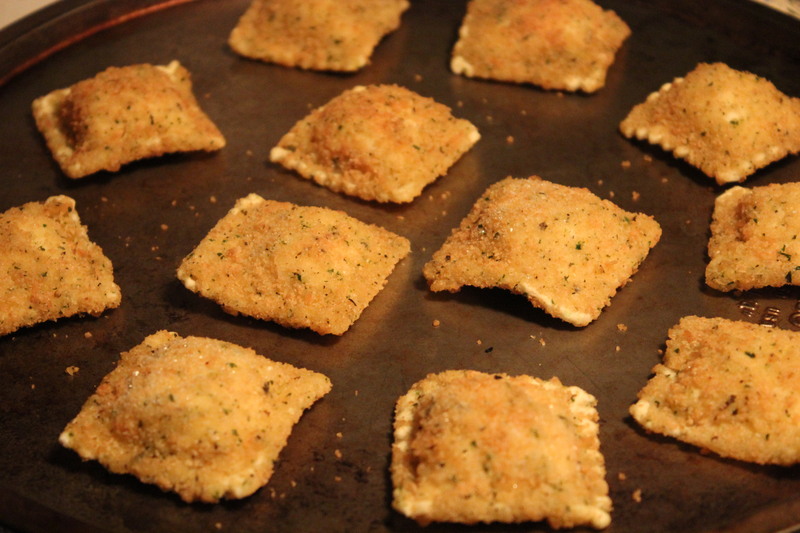 Spray both sides of breaded ravioli with cooking spray; place on the wire rack, or foil lined sheet. Dipped, sprayed, and ready for the oven. 4. Bake in preheated oven until golden brown, puffed and crispy, 15 – 20 minutes. My recommendation is to turn them over about half way through the cooking time so both sides get equally brown and crispy. See how the edges break open and the cheese starts to ooze out? Serve warm with marinara or alfredo sauce for dipping. Oh, Yum!